Mashed Potatoes: To Rice or Mash? Nothing is better than smooth and creamy mashed potatoes. But you may be surprised to know that it's not the fatty additions like butter or cream that create the fluffy, whipped goodness. It is the way in which the potatoes are broken down—either riced or mashed—that results in the ideal consistency of this much-loved side dish. So should you mash or rice the potatoes? It depends on your preferences—like whether you like light and airy potatoes, use unpeeled potatoes, or which tool feels better in your hand. Using both the ricer and the masher are labor intensive so neither tool is a shortcut. Just don't pull out the food processor for this job—you will end up with gummy mashed potatoes. 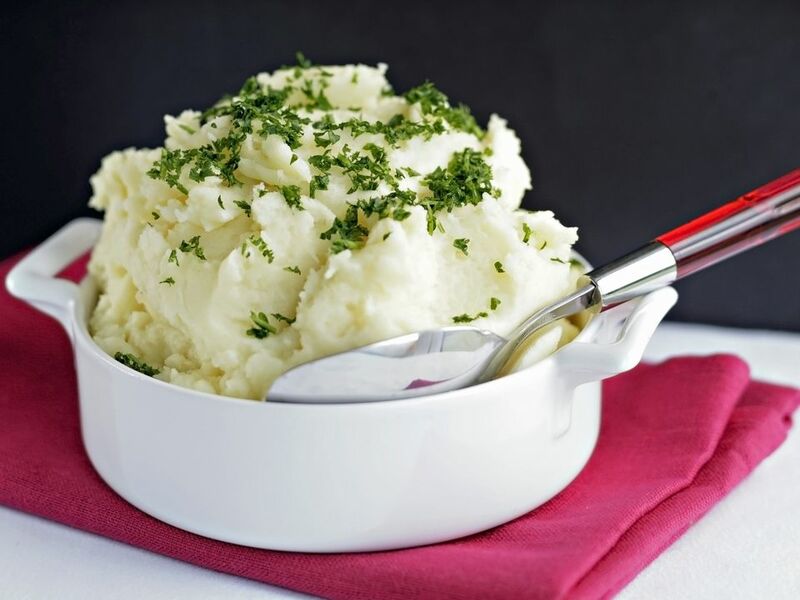 To achieve clump-free mashed potatoes, most experts recommend using a ricer. A ricer is made up of the hopper, where you place the potato, and the plunger, which you press down to force the potato out. Forcing the cooked mealy potato through the ricer's small holes creates rice-sized pieces of potato (hence the name) and the air that is incorporated while pressing contributes to the light fluffiness. If you like to include the peel in your mashed potatoes (either for nutrition or because you don't want the added job of removing it), then a ricer may not be the tool to choose. You can place unpeeled potatoes in the ricer, but you will have to consistently remove the peels from inside the hopper after each batch. An alternative to the ricer is a food mill, which is a hand-crank machine that forces the food through small holes in a sieve. If you don't have a ricer or a food mill, you can make do with a colander, using the back of a large spoon or a smaller bowl with even pressure to push the potatoes through. This takes a lot of strength, but it will work. It isn't really possible to get light and airy mashed potatoes with a masher, but you can achieve a silky texture. To do this, you will have to be methodical while using a potato masher. You need to master a simultaneous motion of pressing and twisting while you make sure you are mashing all around the edges of the pot, not missing any areas. Be sure your potatoes are fully cooked and, if need be, add a bit of liquid to move along the process. Waxy potatoes will still retain more texture, even when processed through the ricer. Most people prefer to simply mash or smash waxy potatoes and enjoy the lumps of potato flavor. Whichever type of potato you use, be sure the cooked potatoes have been completely drained of water. Afterward, return the drained potatoes to the pot and heat, while gently stirring, to eliminate any residual moisture before mashing or ricing.